Parichat International Golf Links. This new golf course was completed in 2016 and has a small residential area of developable land along the fairways for a few homes to be built. Parichat International Golf Links has an excellent position close to Pattaya City, 3 International schools and full access to all industrial hubs in the region. The plot has 2 access routes. One is through the golf course itself, and it’s also possible to come in from the side of the course directly from Highway 331. The rough dimensions for this plot are 120 metres along the fairway, and 40 metres deep from the road to the boundary of the lakes which separate it from the fairways. An elevated home would give the opportunity to see the whole golf course, and have some spectacular landscapes as the sun sets over the course! There are 2 golf greens within 150 metres so there’s a great feeling of being part of the action. It would be possible (once purchased) to split & cut the land into smaller plots for development. 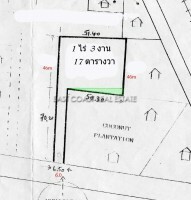 The 3 Rai plot is sold in Thai name, with all taxes and transfer fees split equally 50/50 between buyer and seller.